An all-too-literal contemplation of Tim Rice and Andrew Lloyd Webber's popular Evita, brought to Belfast's Grand Opera House as part of a UK Tour, is ill-advised. The history of Juan and Eva "Evita" Peron is given a glossing over, some duets are cacophonic, the relentlessly genre-hopping score is occasionally discordant, and so on. But as a vocal, visual and rhythmic spectacle, as a reflection on damaging upbringings, and a commentary on how even the most charismatic and well-intentioned leadership can backfire on both figurehead and public, it attains a graceful, passionate reverberance. Moreover, what is a tragedy for Evita (the character) is an undisputed triumph for her on stage alter ego, with Dublin's Lucy O'Byrne (of The Voice fame) successfully applying and adapting her operatic tone and pitch in a performance of dextrous maturity. Being a touring production, directors Bob Tomson and Bill Kenwright have gone for a "simple but effective" look, pillars, staircases, suitcases, microphones, Argentina flags and much more used as and when appropriate. Spot effects and lighting are sparse but prominent, enabling O'Byrne's Eva and her leading men Che (Glenn Carter) and Juan Peron (Mike Sterling) to command the stage along with their dedicated supporting cast and chorus. The intent of the show is laid down immediately with the large "Argentinian-coloured" curtain that covers the stage beforehand, the downtrodden clearly visible amongst the proudly patriotic blue, white and blue. It is this divide – capitalism vs. socialism – that will be at the centre of the play, with Glenn Carter's pivotal and (vitally) personable Che our narrative "middleman", the voice of the goings-on in song. Eva seems made to be a popular public figure. Her success as an actress is testament to this. Yet in a thirty-three year life, ended by cancer, that involves the death of her father at a very young age and eventually being First Lady of Argentina alongside Peron, she is to learn that the road to hell really is paved with good intentions. Lacking a father figure leaves her dependable on finding a replacement to fill the void, leading to frequent involvement with richer, older men. The carefree rebel in her steadily, dramatically transforms into a confident, or worse, patronising establishment figure near the end of the first act, leaving Peron's mistress (Cristina Hoey) to perform a rendition of "Another Suitcase In Another Hall" that brings tears to her eyes, and ours. It is a touching distillation of the "women as commodities" crisis of Cahoots NI's The Assistant's Revenge – and partly foreshadows Evita's eventual fate, something she doesn't consider while she massages both Peron and his ego. The legendary "Don't Cry For Me Argentina" is a contradiction in itself, a collection of warring emotions. Is Eva telling everyone that deep down, she hasn't really changed ("The truth is, I never left you"), or is she upset that they will never see her as she was? This is amplified by the people vs. profit "Rainbow Tour", which makes it tough, in the public eye, to view Eva as anything other but a saint or sinner, rather than human. One who chooses to advance a cause in the limelight, however well meant, runs the risk of being branded a saviour or scapegoat. It's the what-you-see-is-all-there-is point-of-view, where the person behind the legend isn't properly considered. By the final quarter, Eva's battle has shifted from public favour to her life, with O'Byrne maintaining her composure on the way to a well-earned standing ovation for her and the cast. 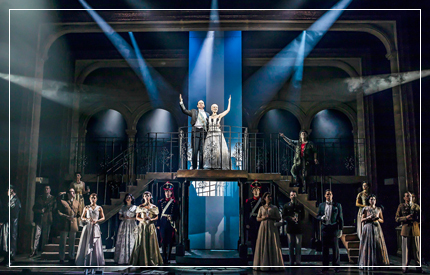 Powerful in both message and spectacle, this production of Evita could well be the perfect musical for the place and character of our times. Evita ran at Belfast's Grand Opera House in August, and will run at Derry-Londonderry's Millennium Forum from October 9-13, as part of a UK Tour.